Australian food rescue charity, OzHarvest, has revealed Australia’s most wasted ingredients in an effort to stop food going to waste. OzHarvest says food waste in Australia is costing the nation an estimated AUD $20 billion dollars each year in commercial and residential waste. Approximately four million tonnes of food ends up in landfill annually and one in five grocery bags of food is wasted. In New South Wales, the average family wasters almost AUD$4, 000 worth of groceries each year. The average household bin is now 35 per cent food waste. To help combat the waste, OzHarvest has launched its 2017 Think.Eat.Save campaign in partnership with the United Nations. 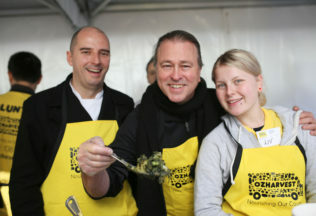 Working with Woolworths, and other corporate sponsors, OzHarvest will be telling Australians to think about what they already have in their fridge, to eat or freeze what they already have and to save food, time and money by doing these things. Chief Executive Officer of OzHarvest, Ronni Kahan, said Australians can help cut the 1.3 billion tonnes of food wasted globally each year by starting by changing things at home. “People shop for the week, stack the fridge and food gets forgotten – stuck in the dark corners of the vegetable crisper or hidden behind jars of jam,” Kahan said. “It’s the main reason why people waste food at home,” she said. Woolworths is bringing back its popular ‘Fresh Market Updates’.